If you have been to Russia, we can guarantee you brought this unique symbol of the nation home. The famous wooden nesting doll - Matryoshka is very popular among tourists, and today we would like to tell you why. So, that if you ever travel to Russia you would know why the beautiful colorful doll is worth spending a few dollars on and which one you should go for. The never-ending hype around these nesting dolls is first and foremostly a solid reason to bring one back home from your trip to Russia. The name of the toy is actually among the top words that are associated with Russia. Interestingly, the Matryoshka name is one of the few Russian titles that wasn't changed...well just altered a little bit (Matreshka, Matrushka, Matrioshka, Matreoshka) when borrowed by other languages. Not only is it easy to pronounce for foreign travelers it is also very memorable, highly popular and getting one is a must! Secondly, the unique construction of the doll makes it a one-of-a-kind souvenir. The wooden nesting dolls are made up of two parts, so once you unscrew it, you find an identical smaller figurine inside, then you open that one and see an even smaller Matryoshka stacked inside and then you open that one and... you get the gist. The size of the set of Matryoshkas you choose to bring back is really up to you and the variety is vast. By the way, did you know that the world's smallest matryoshka piece was the size of a grain of rice? Very luggage friendly! 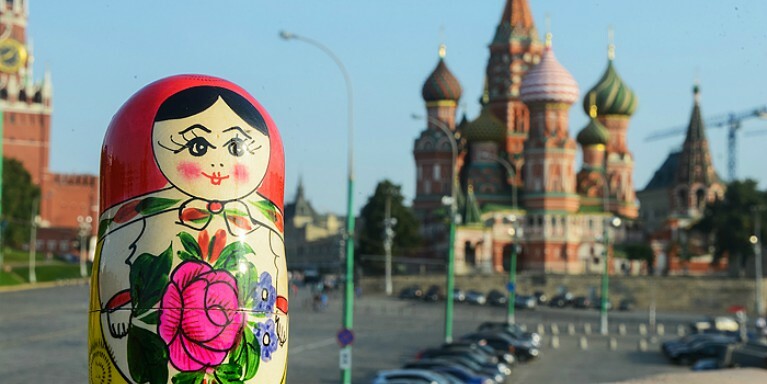 Thirdly, the history and the meaning of the Russian symbol could also be one of the motives to put the doll in your souvenirs' shopping basket. The special toy has been around for 125 years, with the first set of dolls appearing near Moscow in the late 19th century. However, the doll originated from Japan. The ancestor of this toy is believed to be Japanese sage Fukurama, a nesting doll depicting a good-natured old man with a disproportionately big head. The Japanese figurine contained only four identical figurines inside, whereas Matryoshkas are averagely stacked up of eight. The Japanese figurine was discovered by Elizaveta Mamontova, wife of an industrialist entrepreneur Savva Mamontov who has brought the nesting doll for her from his business trip to Japan. A couple decades later, inspired by the nesting principal, Vasil Zvezdochkin has crafted the wooden shape and the artist Sergei Malyuting painted the first doll as a beautiful Russian woman, which quickly became the most popular toy. Back then, the doll wasn't actually called Matryoshka, but Matrona, which has originated from the Latin word "mater," meaning mother. The name uncovers the true meaning of the doll - a symbol of motherhood and continuation of life. The first sets of Matryoshkas alternated in the gender and design of each toy with the last figurine depicting a baby in diapers. The Matryoshkas would represent a whole family with children of different age. Moreover, you can even attend a Matryoshka workshop, where you can learn the unique art of the Russian symbol and paint your own doll. While you enjoy letting your creative juices flow as you decorate your Matryoshka, you also get to learn more about the process of making the wooden structure. As such, the nesting dolls are made either from lime, birch, alder or aspen trees, and the logs should be stored in a well-ventilated place for at least two years. The master always starts by making the smallest figurines of the set and then continues to turn each one. Lastly, you could bring back a different Matryoshka set from each region of Russia as there are many types of the nesting toys. You can even guess which part of the country the souvenir is from depending on the design. For instance, if the doll's scarf is tied in a knot with only two strands of hair visible, then it is most likely from Sergiev Posad (northeast of Russia) or if the scarf is small and has a big flower on top - the doll comes from a small village Maidan. Meanwhile, The Vyatskaya Matryoshka type is believed to be the most difficult to create as each piece of the set is decorated with the rye straw. There are actually fun untraditional Matryoshka sets on sale in Russia, for instance depicting world-known presidents like Putin, Trump, and the Russian Duma Politicians. You could also find different characters from famous animations or video games like Super Mario. If you find yourself standing in a souvenir shop, feeling overwhelmed by the wide selection of different Matryoshkas, we suggest making a safe choice and choosing the traditional nesting doll. The conventional design depicts a young Russian woman dressed in native costume (sarafan) with a scarf on her head, holding a black rooster or a bunch of flowers. During your tour to Russia, you should visit the museum for these nesting dolls, which opened its doors in Moscow in 2001, and learn all about the different types and origins of Matryoshkas.